What’s for dessert? Cupcakes. 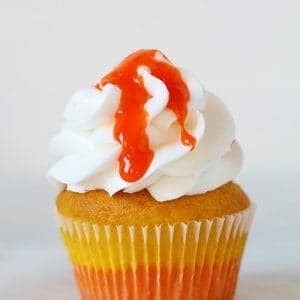 Glorious dual-toned, frosting piled high, covered in an obscene sweet glaze decadent Candy Corn cupcakes. Tint one batch yellow with 1/3 teaspoon yellow food color. Tint second batch orange with 1/4 teaspoon yellow food color and 1/8 teaspoon red food color. Fill each paper-lined muffin cup 1/3 full with orange batter. Gently add yellow batter on top of orange batter, filling each muffin cup 2/3 full. Bake as directed on package for cupcakes. Cool cupcakes on wire rack. Reserve 1/4 cup of candy corn then place the remainder of the 11-ounce bag in a medium saucepan. Pour in 1/4 cup water and heat on low for about 10-15 minutes. You will want to candy corn to be melted completely. Using a spoon, drizzle glaze over frosting. Can be done 1-2 days in advance.